Lightspeed Magazine is edited by the formidable John Joseph Adams, who has produced a long series of wonderful anthologies and is soon to launch a new horror magazine. One might be concerned that such a busy schedule would mean that something would get short shrift, but if that is the case, it certainly isn’t Issue 26 of Lightspeed. About half of the content of this magazine, which is produced in electronic format only, consists of interviews, novel excerpts, an artist gallery and spotlight, and author spotlights. In addition, roughly half of the fiction offered is original; the rest is reprinted, though the choices are inspired. The novel excerpts are available only to those who purchase the magazine, as is an original novella; the remainder of the content is available for free online, issued a story or two at a time over the course of the month. “Lune and the Red Empress” by Liz Williams and Alastair Reynolds is the novella. It’s a fine work of steampunk, with the requisite blimps playing a starring role (here they are called “argosies”). The heroine is Lune, who is in the service of Madame Bezile. Bezile has sent Lune on a mission to steal an egg, a source of physical power in what seems to be a distant future, when today’s fossil fuels have been exhausted and the Earth is in the grip of a winter that will never end. The eggs have been around for centuries, having been constructed by humans as insurance against the winter; their existence is all that stands between the world and slow, freezing death. Lune finds not only the egg, but a new purpose. There is fire in this story, and I would not be surprised to find it nominated for awards next year. Jake Kerr’s “Requiem in the Key of Prose” is about a world in which breathable air is at a premium, and cities have cobbled together domes and oxygen-generation arrays at speed and under pressure. Some cities survived; most didn’t. When Norfolk, Virginia’s system suffers from a mechanical problem, someone has to go deep into the machinery to fix it, and that someone is Adam. The reader has already gotten to know Adam a little bit by the time the problem shows up, and so his plunge into this dangerous situation is especially fraught. Kerr tells his story in sections named for verb tenses, grammatical errors and the like — “passive voice,” “foreshadowing,” and so on. Although it isn’t necessary to the story, it enhances its poetic nature. There may not be much that is new in this story, but it is beautifully told. One of the reprinted stories is Joe Haldeman’s “Four Short Novels.” It’s a powerful story that has lingered in my memory since I first read it, ringing the changes on the subject of immortality. Each of the four sections is named for a famous novel: Remembrance of Things Past, Crime and Punishment, War and Peace and The Way of All Flesh. Each begins with the words, “Eventually it came to pass that no one ever had to die,” and that sentence ends with a different “unless” or “so long as.” Each deals with a different problem associated with immortality: the desire for innocence after a long, long life; crime in a world where punishing someone with death is not a permanent solution; war, and selling people on the idea of being a soldier when it could cut immortality short; and love. It’s not surprising that this story was nominated for a Hugo Award when it was first published in 2003. A.M. Dellamonica’s “The Sweet Spot” is an odd story about a world in which Earth is the site of a war between an alien species known as “the squid” and The Friends of Liberation, known familiarly as the “Fiends”; I was never clear on whether this second group was another species of aliens or humans protesting the takeover of Earth by the squid. The story deals with Ruth and Matt, a brother and sister who still converse with their father even though he’s dead; technology is such that “conversation” can be cobbled together by an artificial intelligence using recordings of their father’s voice. Their father had had an affair with one of the squid, Isshy, and Isshy promises them safety when they are kicked out of the parking space in which they live. Even after a couple of readings, I’m still not entirely sure what this story was all about, even though the plot is clear enough. Apparently this story is one of a series set in this universe; it does not stand well on its own. I greatly enjoyed another reprint, “The Giving Plague” by David Brin. This story posits that a virus is responsible for encouraging people to donate blood, and that the good feeling they get from that act of charity encourages them to other acts of charity. The scientist who discovers this virus doesn’t want to make its existence known, though; he wants it to reach epidemic proportions. His partner in his lab has visions of a Nobel Prize dancing in his head, though, and plots to kill the scientist who made the discovery and claim it as his own. It’s a long-term plan, though, and things go seriously awry before he can put his plan for fame and glory into motion as other plagues come along and threaten to destroy the human race. The notion of a virus for altruism is fascinating, and the question whether it would be an unqualified good thing is fascinating. Aidan Doyle’s “Ghost River Red” is another good story, this one original. It is about Akamiko, a swordwriter with a task: she must spread the ashes of the Lady of All Colors, her mentor, in her home village on the anniversary of her death. To do so, however, she must defeat a ghost who has taken up residence in the cemetery. The ghost is the father of a six-year-old boy, Toshi, who will die if the ghost is banished, so Akamiko’s job is made more difficult by the child’s mother, who is determined that her son live. Another reprint, “Singing of Mount Abora” by Theodora Goss, is exceptional. It is the story of Alem Das, a maker of musical instruments who charms the materials for his work from unusual sources: the skin shed from the body of a sea serpent for a drum, the whiskers of a dragon to string a dulcimer. It is also the story of his niece, Kamora, a servant to the empress and the would-be wife of the Cloud Dragon, who is a man at night. And at the same time it is the story of Michael and Sabra, and the story of Sabra and Samuel Taylor Coleridge. All these tales are bound up together in an almost hallucinatory story that shifts like colors in a sunset from tale to tale, until it is almost impossible to tell one tale from another; and yet they all work together like the reds, pinks, yellows, oranges and blues that make up a sunset. Goss is an exceptional writer, and I look forward to her first full-length novel with great anticipation. Peter Beagle’s “Gordon, the Self-made Cat,” is a reprinted bit of whimsy that will make any reader smile. Gordon is a mouse who undertakes to become a cat, eschewing the notion of being eaten by his classmates at cat school. He does well in his classes on Dealing With Dogs and Getting Down From Trees, and learns much from a seminar on the various meanings of “Bad kitty!” He graduates at the top of his class and joins the faculty, doing just fine until the fateful day when he meets a dog who wants to eat him right up. What happens from there is, perhaps, not all that surprising for an enterprising mouse. “Give Her Honey When You Hear Her Scream” by Maria Dahvana Headley is a love story about two people who meet at a wedding. These two people, unfortunately, have spouses: one a magician and the other a witch. The spouses meet up to plot their revenge, and their toast to “forever” has consequences for all four people. Two novels are excerpted: vN by Madeline Ashby and Spin the Sky by Katy Stauber. I’ve never been fond of such excerpts; they tell me too much and yet not enough about a novel to determine whether I want to read it. I find a review much more useful, and even jacket copy is more to my purpose (though I usually avoid reading that, too: too many spoilers). Both of these novels seem interesting enough based on the excerpts. The interviews in this issue are particularly interesting. The first is with Brian Greene, a professor of physics and mathematics at Columbia University and the author of a number of books that attempt to explain difficult concepts to a lay audience, particularly regarding astrophysics. He discusses some of these concepts in the interview, as well as how he works to make complex scientific ideas accessible to the average reader. He also discusses his own interest in science fiction and the interaction between science fiction and actual science, particularly in films. His explanation of parallel universes is particularly interesting. The second interview is with Garth Nix, the author of Sabriel, Lirael and Abhorsen as well as a number of other young adult fictions. He discusses how being Australian has affected his fiction, his history as a writer, and how he goes about inventing worlds and characters. The interview has more depth than many others that are being published these days. The artist gallery, featuring work by Chris Cold and Tobias Roetsch, looks like nothing much at all on a standard issue Kindle, but if you take a look at the work in color on a high resolution monitor, it’s breathtaking. Both are digital artists, Cold working in Russia and Roetsch in Germany; their collaboration seems unusual and fruitful. They discuss how they work together in their interview, as well as their sources of inspiration and the development of digital tools for art. 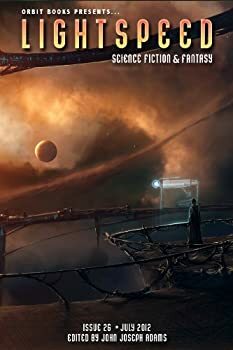 Finally, this issue contains a short “author spotlight” for each of the stories in which the authors discuss the inspiration for their stories. They’re fascinating to read, especially for those who would themselves be writers. Ideas are everywhere, it seems; it’s great fun to read of the varied sources of creativity.